There are thousands of G-protein-coupled receptors on our cell surfaces, each waiting for its own particular messenger molecule. When the messenger is sensed, the G-protein associated with the GPCR initiates a chain reaction that amplifies the signal and yields an immediate cellular response. 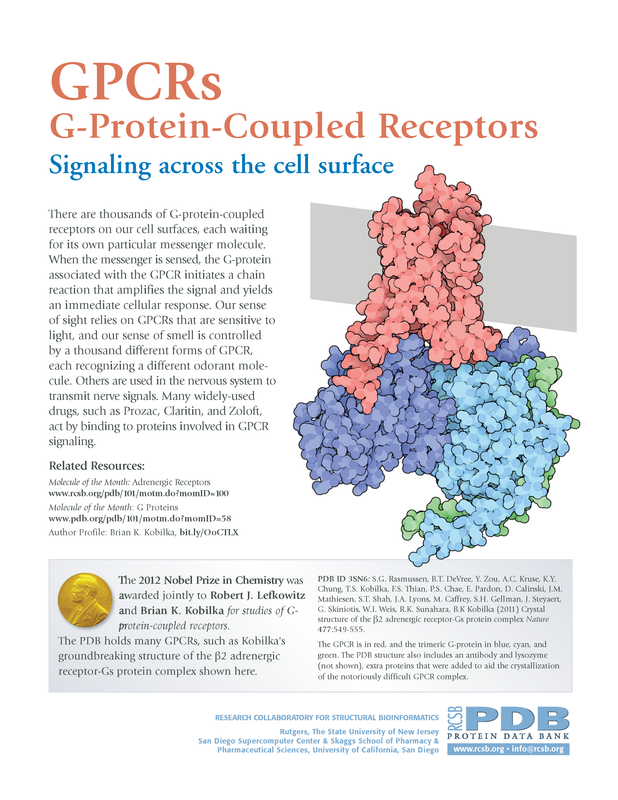 Our sense of sight relies on GPCRs that are sensitive to light, and our sense of smell is controlled by a thousand different forms of GPCR, each recognizing a different odorant molecule. Others are used in the nervous system to transmit nerve signals. Many widely-used drugs, such as Prozac, Claritin, and Zoloft, act by binding to proteins involved in GPCR signaling. This flyer commemorates the 2012 Nobel Prize in Chemistry.